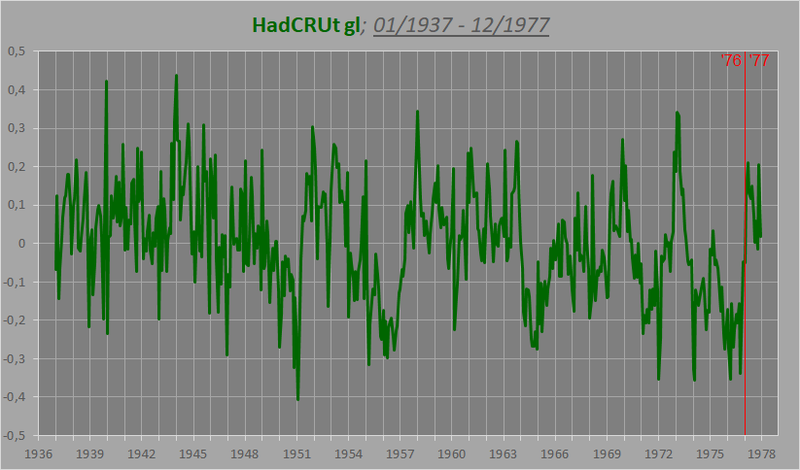 A little bit about tracking Earth’s ToA net flux (‘heat balance’) anomaly from 1985 until today. We have the same two associated but separate radiation flux datasets on hand (ERBS Ed3_Rev1 and CERES EBAF Ed4) as we did when we established our two OLR composite records in the main post. However, this time around, calibrating the mean levels of the two distinct sets of flux anomaly data across the 1999-2000 gap that separates them, and to find any kind of real confidence in the result, is way harder. Not qualitatively, though; 1) we’re quite certain that they – the mean anomaly levels – should be generally positive on both sides of the splice, and 2) we are pretty confident that the mean anomaly during the first four years of the record, 1985-88, was fairly close to zero, the net ToA flux hovering around neutral. 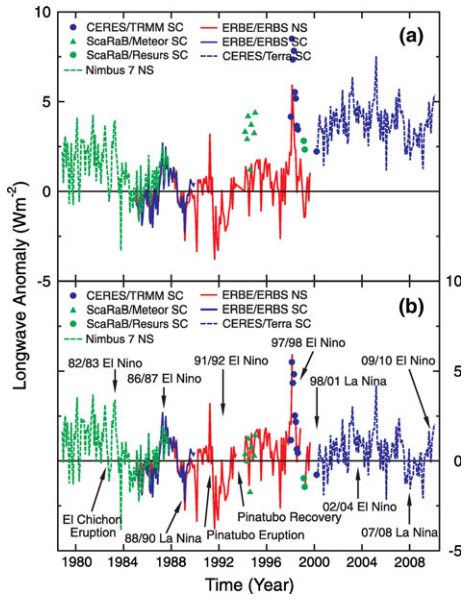 The problem is distinctly a quantitative one; in determining the magnitude of the mean anomaly adjustment required to calibrate the latter part of the record (the CERES data) to the former (the ERBS data). What distinguishes a ‘Net flux composite‘ from an ‘OLR composite‘ is in the way we “anchor” it. The OLR, Earth’s heat loss to space, will over time, as we firmly established in the main post, simply be a direct function of tropospheric temps, more or less a mere radiative expression (effect) of them. The Net flux, however, ASR minus OLR, Earth’s heat balance, will best translate into an Earth system heating (or cooling) rate, i.e. the total net storage of internal energy over some specified time frame, like a month or a year. 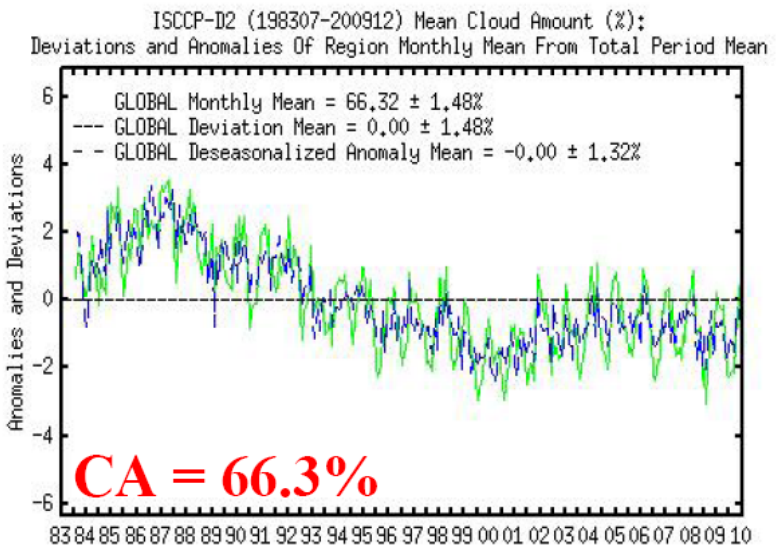 We can use OHC data to calculate such a rate, and in turn determine (“anchor”) the net flux anomaly from this. The main problem with the OHC→net flux approach is what depth layer to go by. Do we use the 0-700m layer as our guide? Or the 0-2000m layer? Or some other one? The question you need to ask yourself is this: How deep into the ocean can we really expect a ToA net flux signal to penetrate? Figure 32. It seems likely that the net flux underwent a multiyear decline between the high level around 1995-98 and a closer-to-neutral stretch around 2000-2003/2007 (however you prefer to read the graph above), with the bottom ostensibly reached some time around 2001-2002, before it slowly, but steadily started growing back (from 2002-2003 already, but especially from 2008, and even more consistently so from 2011 onward). We know from the main post, looking at the ERBS and the CERES data separately, that an increase in ASR is the clear reason behind both confirmed periods of rising positive net ToA imbalance over the last 32-33 years; first the one from 1988-89 to the mid-to-late 90s, and then again the one from 2002 to the present high level (2012-2017), and that a parallel increase in OLR was very much what kept it from running away in both cases. 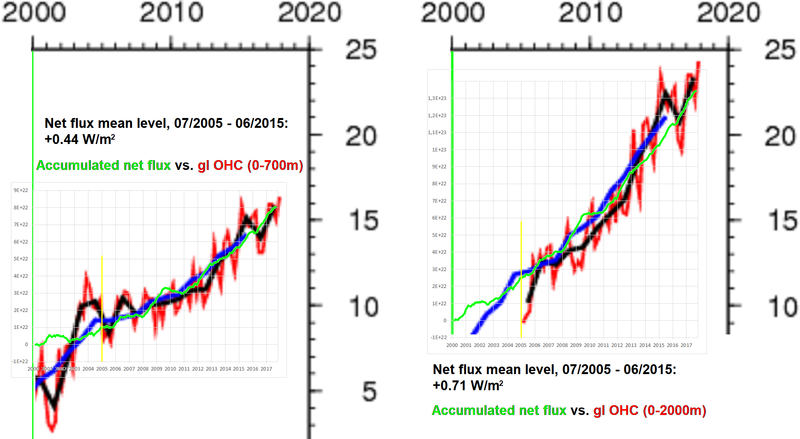 That 2005-15 mean level is about 0.27 W/m2 higher than my estimate in Fig.32. It appears the difference simply lies in how much water column one considers reasonable to include in determining an existing ToA net flux. In the end, it all must come down to personal preference, because this question isn’t one that can be fully resolved simply through objective deliberation. I would say that including water masses below 700 – even 300-400 – meters of depth is meaningless in this regard; there is no immediate, first-order connection between a change in the radiative balance at the top of the atmosphere and what happens with the temperature a kilometer or two below the surface of the ocean. If anything, if warming of the water masses in the upper parts of the ocean (0-700 (300-400) m), where the connection and energy exchange with the atmosphere and the Sun is much more direct, were to gradually propagate (diffuse) downwards, which in itself is a perfectly plausible scenario, this would surely be a slow and creeping process involving considerable lags, naturally making any observed warming signal at depth, say, 700-2000m below the surface, utterly out of sync with the presently operative net flux at the ToA. Either way, “MCS” seems very much in favour of using the deeper layer (0-2000m) when setting the post-millennium (CERES) ToA net flux mean level anomaly. An average of +0.71 W/m2 for the period 07/2005 – 06/2015 seems to square quite well with the general rise in NOAA/NCEI’s official OHC curve for the 0-2000m depth layer since 2005. My estimate, as it turns out, conforms much better with the progression of the 0-700m curve. Go figure! The interesting thing here, though, is that, even if they’re right and I’m wrong, the explanation behind the positive net flux value remains the same: A sustained high level of solar heat input (ASR) to the Earth system from 1988-89 onwards. 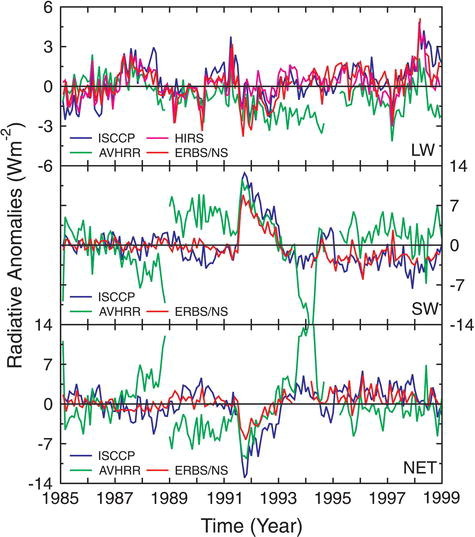 Stating a larger positive net flux value after 2000 simply necessitates a larger solar heat surplus, a higher mean ASR level, after 2000 than what I’m suggesting, since we after all can be pretty certain that the OLR didn’t just increase with the tropospheric temps from 1985 to 1999 (ERBS) and from 2000 to 2017 (CERES), but also from the 90s to the 00s, from the ERBS era to the CERES era. 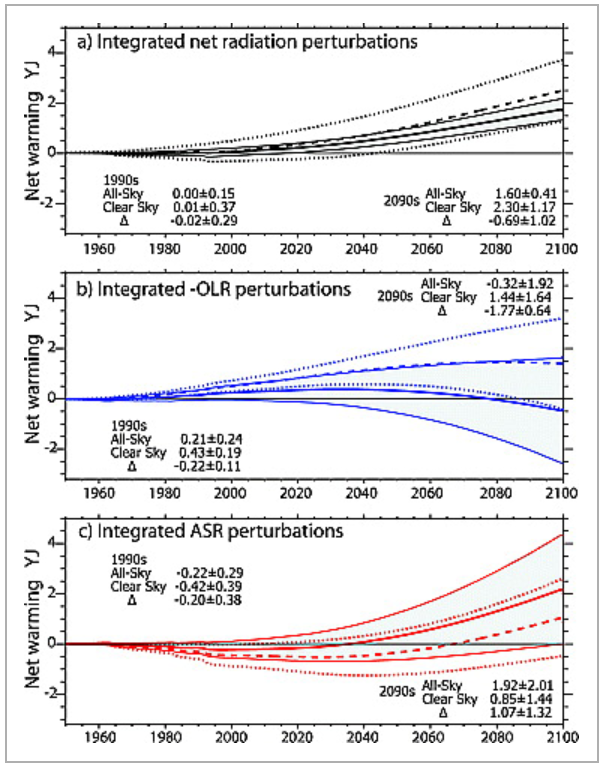 We see the gap (ASR over OLR) opening up in 1989, we see it widening during the 1993-97 period, before it drops and starts closing up again, a combined result of a weakening of the incoming solar heat flux (–ASR) and a simultaneous strengthening of Earth’s own outgoing heat flux (+OLR), the latter effect, as we now know and understand, a direct radiative (Planck) response to tropospheric warming, the tropospheric warming in turn a system response to the, after all, quite strongly positive net ToA imbalance that persisted all the way through the 90s. We finally see how the gap reopens, slowly, but steadily, from 2002-2003 on, and how since 2012 it has once more reached a rather substantial magnitude, yet again all thanks solely to the increase in ASR, and only countered somewhat by the concurrent, but much smaller, temperature-driven rise in OLR. It almost goes without saying that ‘Mainstream Climate Science (MCS)’ has its very own stated version of how ‘global warming’ came about. The interesting thing to notice in this regard is how this particular version was established, and how one seeks to justify, not just its validity, but in fact its professed preeminence over all other ‘versions’ out there. Their approach is an unusual one. In their efforts to explain what one might view as a concrete physical phenomenon, global warming, they have decided to rely exclusively on the output of model simulations and to fully disregard all real-world observations directly pertaining to it. Their claims about the world on this particular issue thus come purely as the result of conjecture. Based on certain theoretical considerations and nothing else. So what, then, are the models saying? The models, of course, operating within a realm fully detached from the real – observationally constrained – one, a realm where theory is rather always circularly allowed to verify itself, are essentially free to make up their own story, their own truth, as they go along. Completely unaffected by the course of events actually observed to play out in the real Earth system. And this story – the model story – is then also, quite naturally, the official story of ‘MCS’ on the ‘global warming’ issue. And so, as you can gather, the models are the ultimate source and alibi, the only source and alibi, of the ‘SW(+ASR)-warming-is-just-a-positive-feedback-to-LW(–OLR)-warming’ argument. To outsiders, the whole argument feels a bit cheap, more like a ‘factoid’ or a ‘talking point’, like a seemingly plausible ad hoc explanation concocted on the spot to salvage an original hypothesis from what at first glance would look like pretty detrimental real-world observations; akin to the whole “every and any weather (and climate) pattern is consistent with the idea of anthropogenic global warming” meme. “As greenhouse gases and associated radiative forcing increase [from 1950], the models amplify the effect through increases in water vapor. Hence both clear sky and all-sky integrated OLR decrease initially (Figure 1 [my Fig.36]) and there is a net heating of the planet. Snow and ice also begin to decrease and reduce albedo at high latitudes (Figure 2), thereby providing further amplification through ASR increases – the ice-albedo feedback. (…) From 1950 to 2000, the net result globally is a decrease in OLR and a net heating. Only after about 2050 does the increase in temperature become large enough to overwhelm the increasing greenhouse effect (Figure 1) (…). Figure 37. Notice the y-axis. It spans a range of 5 W/m2. The positive net imbalance starts opening around 1970, after having hovered comfortably around the zero line during most of the previous 100+ years, volcanoes the only (short-term) disruptions to what appears to have been a relatively fine-tuned balance. Note, however, that even though there’s a slight upward movement in the net curve to be discerned already from 1970 onwards, it only makes its first substantial leap up across the 1976-77 transition. Coincidence? Figure 38. Yup, we can very much appreciate from this chart why MCS is simply forced to a) reject the validity of the calibration across the 1993 gap in the ERBS dataset, even though they both do (Trenberth et al. above) and don’t (e.g. Allan, 2017; Loeb et al., 2012), and b) deny the correctness of the OHC data over the 1977-88 period, even though they both implicitly do (here) and explicitly don’t (at all other times), as the former shows a distinct ±1 W/m2 rise in the near-global net flux between the 1985-88 period and the 1993-97 period (Fig.6), and the latter clearly showing no positive overall change whatsoever in global OHC, indicating a ToA net flux anomaly level of essentially zero, from 1977 to 1988 (Fig.2). The models, according to Fig.38, claim a steady rise in the positive net flux value all the way from ~1970 and up to ~2000, when for some reason, it apparently takes a 15-20 year break, at an elevated level approximately 0.6 W/m2 above neutral. Knowing now how the models picture a gradual opening up, from 1970 to present, of a positive net heat imbalance for the Earth system, what is most insteresting for us to figure out is how they view the relative contributions to this ‘net heating’ process of the two (concrete/measurable) opposing heat fluxes that counterbalance to produce the (after all, abstract/merely calculated) net flux between them. That’s the ASR, the incoming heat flux (Sun→Earth), and the OLR, the outgoing heat flux (Earth→space), at the ToA. Figure 39. Notice again the y-axis. It now covers a range of 8 W/m2, not just 5. The green curves in Fig.37 and 38 are simply expressing the arithmetic difference between these two curves: ASR (gold) minus OLR (red). And, lo and behold! What do the models say? 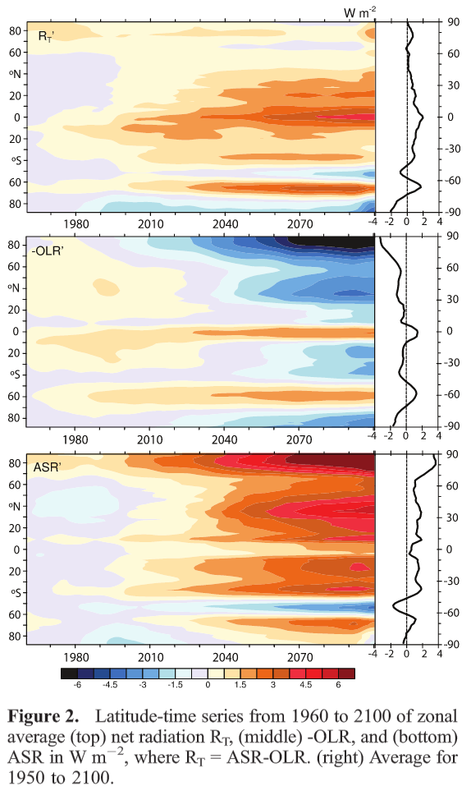 The 2000-2012 mean ASR level appears to be some 0.2 W/m2 below the (granted, slightly uneven) 1860-1960 mean level, while the 2000-2012 mean OLR level seems to be about 0.8 W/m2 below that same base level. So there you have it: The ASR contribution to the current ToA imbalance is (still) somewhat negative, while the OLR contribution is strongly positive (+0.8 W/m2). That’s how the world works. That’s how we’ve gotten our ‘global warming’. Right? Well. That … depends. What do we actually see in Fig.40? We see a sudden drop of about 0.7 W/m2 in the mean level of both OLR and ASR between 1960 and 1965. The funny thing about this is that, since they are directly inversely related, and since they drop by the exact same amount, at the exact same time, this abrupt and significant change in both contributing heat fluxes doesn’t show up as a change in the net heat at all (Fig.38). Even so, one is inclined to interpret this synchronous drop as somehow the result of a specific assumption on the part of the models (and/or of their architects, the modellers) that at this particular point in time there was 1) a massive pulse of (anthropogenic) CO2 injected into the atmosphere, strongly and suddenly affecting Earth’s heat loss to space (–OLR), and, simultaneously, 2) a massive pulse of (anthropogenic) sulfate aerosols dispersed through the atmosphere, strongly and suddenly affecting Earth’s heat gain from the Sun (–ASR). We see that, while the ASR flux naturally regrows in strength after what one might assume is the initial perturbation, the OLR flux doesn’t. It remains more or less at the same sunken level all the way from 1963 till today, including the three deep temperature-induced depressions of the Agung (1963), El Chichón (1982), and Pinatubo (1991) volcanic eruptions. It stays flat even as we know from observations that the world grew considerably warmer over the period. 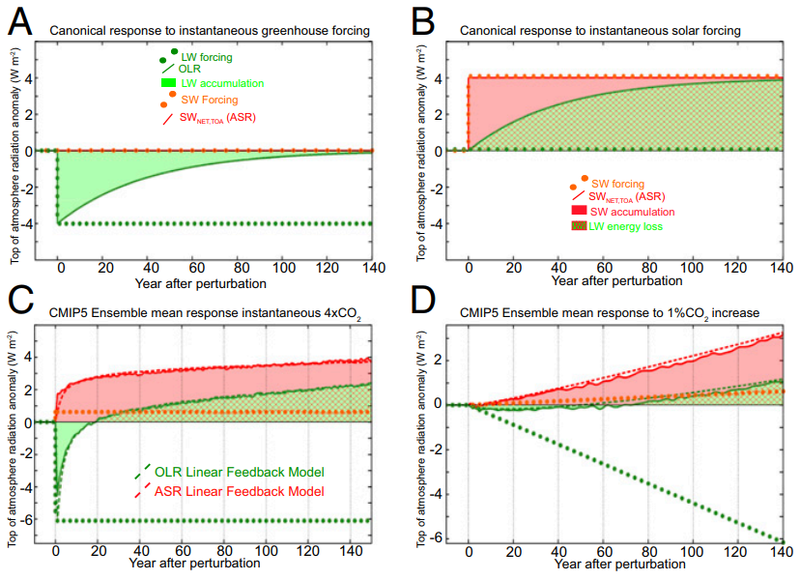 What we see, then, is simply the hypothetical “Greenhouse Warming Mechanism” in operation. Inside the model framework. It is supposed to work (create warming, that is) by holding back Earth’s heat loss to space as the atmosphere grows ever more opaque to outgoing surface radiation, which means that, under such circumstances, keeping the heat loss at the same level over time requires an ever higher temperature. 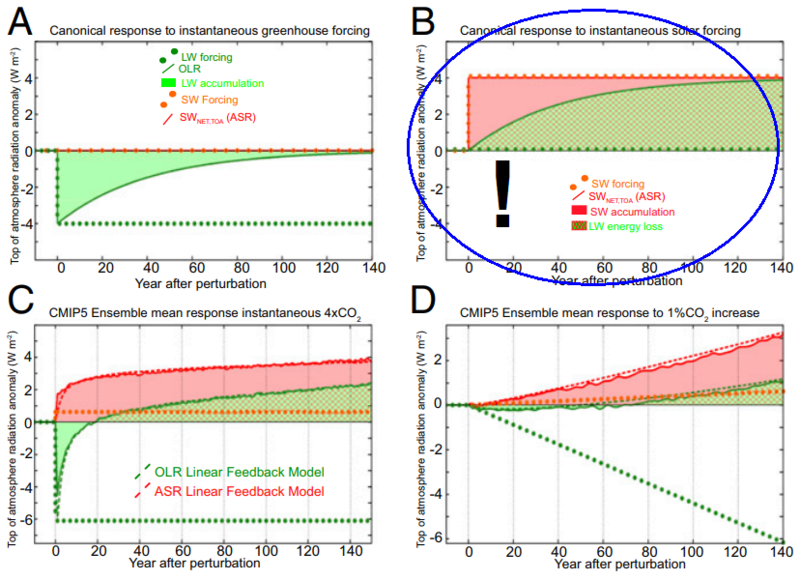 The main problem when it comes to the ASR/OLR plots in Figs.39 and 40 is how to resolve the cause-and-effect relationship. Which of the two fluxes is actually causing the positive ToA imbalance to open? Which of the two fluxes is actually causing the Earth system to warm? 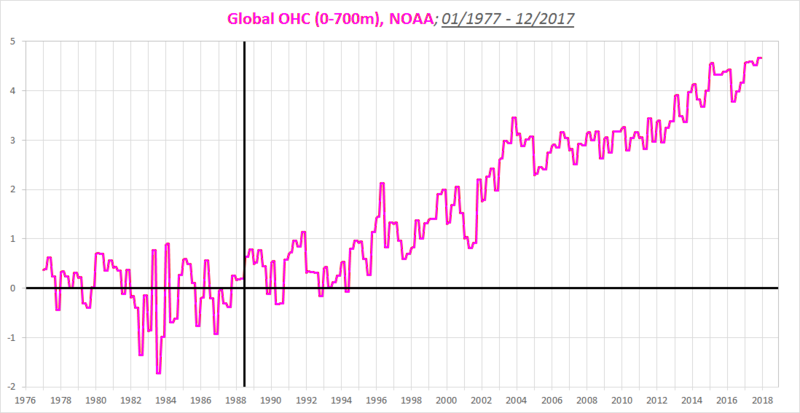 So we can be pretty sure that the sudden and substantial reduction in OLR that occurred around 1960 didn’t produce any ‘global warming’ whatsoever at least up until the end of 1976. But how come the Earth didn’t just not warm, but in fact cooled? If a reduction in OLR – which did, after all, happen, according to the models – is meant to produce warming? Well, it can only produce warming insofar as the ASR, the opposing – incoming – heat flux, doesn’t simultaneously decrease also, by at least the same amount. And as we can see in Figs.39 and 40, this is exactly what happened, once again according to the models. 3) Earth’s heat loss to space is weakened as a natural radiative response to (effect of) the …. 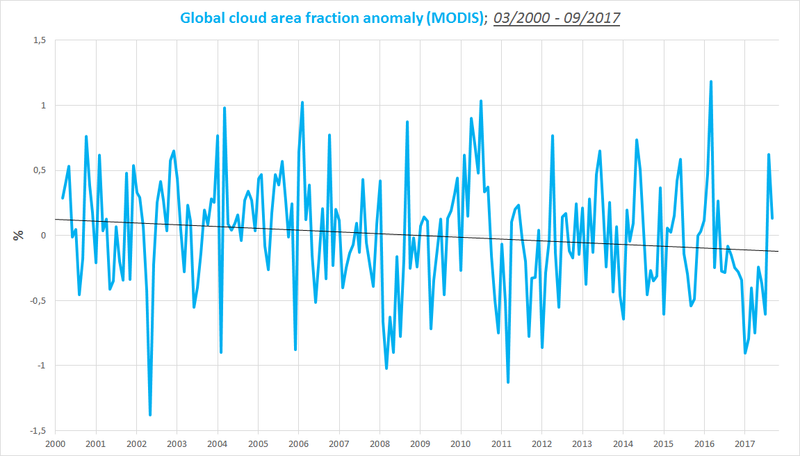 dropping global temps (–OLR). Further, we see the ASR gradually increasing from 1970 onwards, while the OLR stays put. How do we explain this in terms of cause and effect? 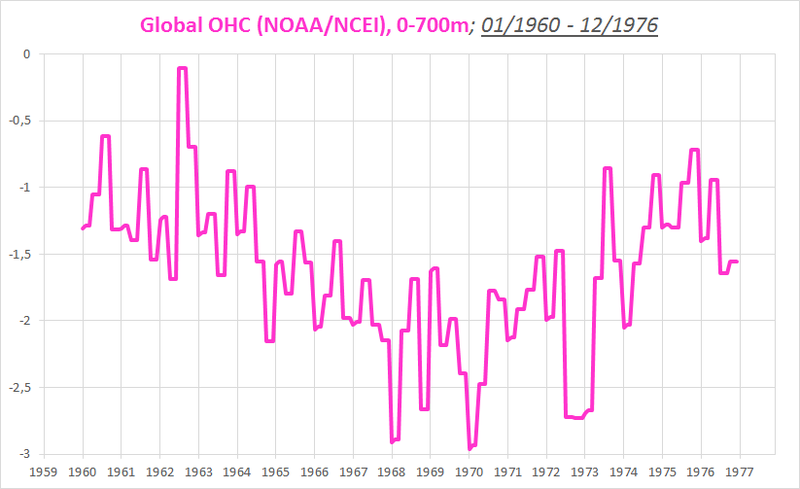 Reduced OLR evidently didn’t cause any warming prior to 1977. If it was low, it was because the temps were low. 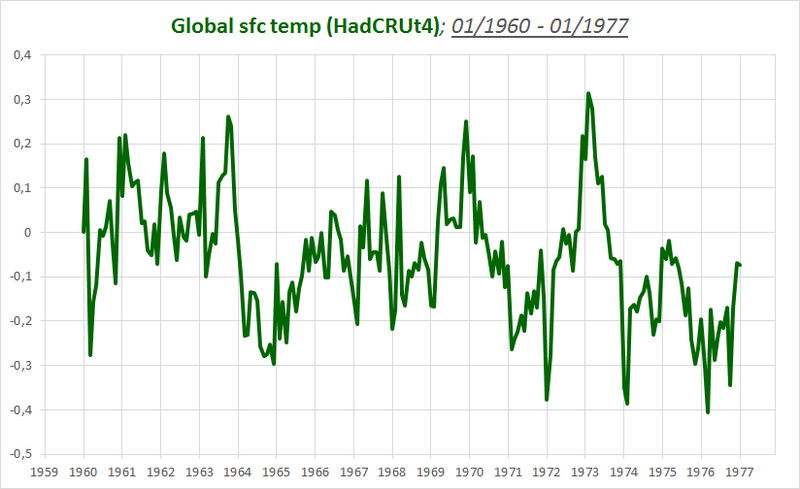 So what produced the observed jump in global temperature going from 1976 to 1977? Well, there was a certain buildup of ‘ocean heat’ from 1970 to 1976, but this very much appears to be ENSO-related (five out of seven years in deep La Niña conditions). And there was no tropospheric warming going on to affect the ToA fluxes; quite the opposite. We see a big upward shift in the positive net flux in Fig.38 across the 1976-77 transition, but that’s clearly the result of a sudden rise in ASR, not in a sudden drop in OLR (Fig.40); the OLR at this point can simply be assumed to remain in a slump due to the low surface and tropospheric temps. So how, when and where is there ANY evidence of “Greenhouse” warming prior to 1977? And how, when and where is there ANY evidence of the same after 1977? Because after we know what’s happened … It’s in the freely available observational data, after all. Collected from the real Earth system. Global OHC data (NOAA/NCEI) from 1977 to 1988, ToA radiation flux data (ERBS+CERES) from 1985 till today. BOTH the ASR and the OLR went up. Directly contradicting the models. Which claim the ASR went up, but not the OLR. claims of observed increase in OLR post-1976/77 is somehow wrong (or the data showing this is way too uncertain to be ‘useful’). But are Trenberth/Fasullo and Donohoe et al. right to distrust the validity of the radiation flux datasets, and thus simply dismiss them altogether? Or are they just pulling their claims of concern out of their … behinds? Loeb et al. (2012) beg to differ. Figure 43. Wong et al.’s Fig.6. The basis for Trenberth’s concerns was simply sorted out by 2006, with the development of the current Ed3_Rev1 version. I mean, how cheap an excuse is this? Limited length!? We have high-quality satellite ToA radiation flux measurements going back 33 years! That’s more years than what’s needed to establish a ‘climate normal’. We can easily determine from these measurements the “relative contributions of ASR and OLR by direct observation,” don’t you worry about that. This matter is discussed at length in the following document: “Assessment of Global Cloud Data Sets from Satellites” (GEWEX (WCRP), Nov 2012). This entry was posted in Greenhouse Effect?, Natural 'Climate Change', Observations & musings and tagged AGW hypothesis, ASR, climate feedback, climate models, cloud effect, clouds, global warming, intercomparison, net flux at ToA, OHC, OLR, SW feedback. ← An atmosphere’s IR activity won’t make it warmer, and so cannot be the cause of surface warming either. Over 11,000 views of my five WriterBeat papers and zero rebuttals. There was one lecture on water vapor, but that kind of misses the CO2 point.